Whether we want to admit it or not, it is officially fall. We have passed the autumnal equinox this year which means according to the calendar, we are officially in fall “mode.” The weather is slowly starting to cool in many parts of the country and fall activities such as apple picking, fairs, heading back to school, and raking leaves are all well-underway. It is time to take the sweaters out of storage and start gearing up for crisp, cool evenings. Why does everyone go on a pumpkin frenzy? It could be because pumpkin is ripe for harvesting during the fall and in many places is readily available. It may also be because pumpkin is synonymous with the fall and it is a key ingredient for harvest themed celebrations and holidays. Regardless of why, fall is unofficially pumpkin season and it’s time to indulge in your favorite pumpkin treats and eats. People love pumpkin. They also love cheesecake. Put the two together, and you have officially made magic. 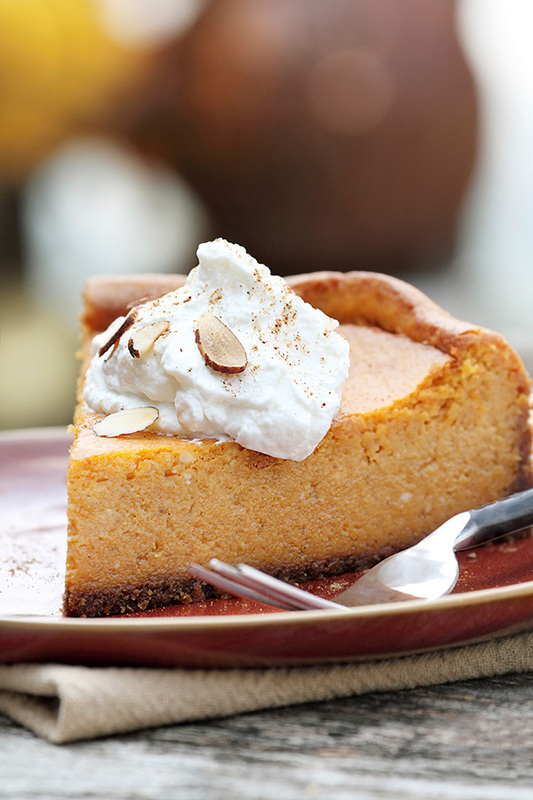 That’s right; you can enjoy pumpkin cheesecake as a dessert, a snack, or even breakfast. Smooth and creamy cheesecake filling gets blended with pumpkin puree to create a cheesecake that is sweet, silky, and a little bit spicy thanks to cinnamon and other spices synonymous with pumpkin such as nutmeg and ginger. Our pumpkin cheesecake is topped with a luscious layer of whipped cream and then sprinkled with cinnamon for a tantalizing finish. Pumpkin cheesecake is an ideal dessert for large family gatherings or as a perfect finish to a hot, home-cooked meal on a cold autumn’s night. We would be remiss if we didn’t mention pumpkin pie, the most famous pumpkin dessert of all. While normally enjoyed for Thanksgiving or Christmas, pumpkin pie is a dessert that can be enjoyed throughout the fall (and even throughout the year). Pumpkin pie is creamy, a little bit sugary, and finishes off with a smooth crunch of pie crust. So what makes it so special? It is the combination of pumpkin with spices such as cloves, nutmeg, cinnamon, and ginger that give pumpkin pie its signature spiced flavor, a flavor that has crossed over to many other baked goods, sweets, and beverages popular during the fall. Previous Previous post: What Cheese Goes In Your Favorite Cheesecake? Next Next post: Celebrate National Apple Month!